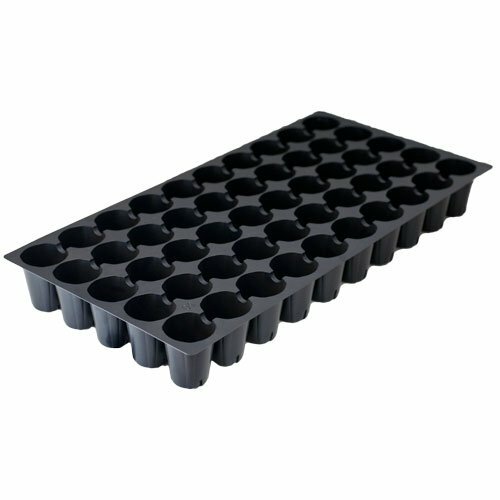 50 Round Cell Plug Tray - Propagation/Seed Starting Tray - 100 trays by Growers Solution by Grower's Solution at Aquaponics In Paradise. Hurry! Limited time offer. Offer valid only while supplies last. Purchase a case of 100 black, reusable 50 cell propagation trays. This tray is great for propagation, seed starting and vegetable transplanting. The 50 round cell propagation tray is perfect for starting seed plants such as tomatoes, peppers and so many other plants. This plug tray is very durable and can be reused year after year. This is 100 individual planting plug trays. The 50 round propagation cell tray will fit into a standard 1020 tray.